What does 2019 look like for Samsung TVs? The world's biggest manufacturer of televisions is, as always, firing on all cylinders. You can expect to see modular televisions, new 8K upscaling techniques, expanded use of the Bixby smart assistant and, strangely enough, an exclusive iTunes app for Samsung TVs. Samsung is expecting the 8K market to grow pretty quickly over the next few years (up to 2 million units per year by 2020, and double that in 2021) but in the meantime the main focus is on the 4K UHD televisions on offer. Update: Samsung has just announced US pricing details for its 2019 TVs. You can find the complete catalog - with pricing details - below! Samsung's new range of dazzlingly bright QLED TVs are now available to buy in the US – or pre-order in the UK, before going on general sale March 27th. If QLED is still a bit too rich for your blood or the idea of a 2,000-nit TV sounds like a bit overkill, don't worry – there are still plenty of mid-class screens that offer solid picture performance at an affordable price. With so many models to take in, we thought it'd be beneficial for to see the entire line-up, from the high-end QLED to the entry-level TVs, all on one page. So what has Samsung got planned for the year ahead? For 2019, Samsung is pushing forward with its MicroLED panels, which feature millions of microscopic blue, red, and green LEDS for an incredible level of color and light control. On the large end, there's the new 219-inch model of Samsung's The Wall, and on the less-large-but-still-large end, the 75-inch The Window – made possible by smaller, more compact clusters of LEDS – with both looking ahead to a flexible future where you can customize your TV shape for any size or aspect ratio you please. Of course, the star of the show for Samsung in 2019 is still the QLED, or 'quantum dot' TV screen – a variation on traditional LED-LCD panels that feature a peak brightness between 1,500 and 2,000 nits. For a reference point, that’s about twice as bright as the competition from 2017 and four to five times as bright as the HD/SDR TV you’re used to watching. Each QLED this year will feature a new ‘Ultra Viewing Angle’ technology, reworking the backlight to ensure improved contrast and colour accuracy even at tighter angles – a necessity given the ever-growing screen sizes. We've seen it in action, and the screens' ability to look as sharp and colorful from the side is pretty astounding – even if you'll likely be watching head-on most of the time. The QLEDs will be getting HDR10+ too, while all but the entry level QLED models will be making use of Direct Full Array tech, to prevent light blooming and allow for greater control over contrast levels. The virtual assistant Bixby will be one of the few common features across Samsung's MicroLED, QLED, and Ultra HD lineups – alongside various Samsung smart appliances, phones, and speakers. An 'improved AI algorithm' will make your Samsung TV better at recommending and displaying relevant TV content and apps, with expanded use of Bixby voice controls through your Samsung remote's 1.5m range microphone – as well as compatibility with Amazon Alexa, Google Assistant and SmartThings connected smart home devices. Not to mention some smart Remote Access features for connecting to other devices through your TV. On the software side, Samsung sets will be getting AirPlay 2 support for streaming iTunes content from Apple devices. 2019 will also be the first time Apple has offered a dedicated iTunes app for movies and TV shows for a non-Apple manufacturer – for now exclusively on Samsung TVs. Samsung's higher-end sets are also able to judge the location of your remote during setup, to optimize sound output for your room size and usual seating location. We're likely to see wider expansion of Samsung's Ambient Mode. When the TV is turned off, Ambient Mode helps the TV mimic the color and pattern of the wall on which the TV is displayed, so that it blends seamlessly into home décor. It can also play music and display information about the news, weather, and traffic as well. While at first limited to QLED TVs, we're hoping to see the mode trickle down into more affordable devices too. The Wall (available in 143, 219 inches): Almost too big to be true? The Wall may not fit on most living room walls, but it's a testament to Samsung's desire to impress – featuring millions of microscopic LED for a huge level of color contrast and brightness control over each pixel. Made of a modular series of panels, the size is technically variable, though Samsung is still selling it in general size configurations as a starting point. The first 143-inch model released in late 2018, though we now know a whopping 219-inch version is coming this year. Whichever you're looking at, you can be sure to expect an absolutely insane price tag. Check out our first look at The Wall by Samsung here. The Window (available in 75-inches only): A smaller, but still objectively huge variation on The Wall television above. It's still modular, meaning you'll be able to vary the size somewhat at installation – and we're expecting it to hit some time in 2019. Samsung’s classiest TV gets an upgrade with a QLED panel – which feels necessary, given that the picture quality was the only thing letting this gorgeously made hunk of metal down. Blending form and function, this style-focused television may be the most attractive television Samsung has put out. Check out what we thought in our hands on The Frame (2019) review. Samsung's stylish Serif TV also gets a QLED panel upgrade, hoping to marry looks and picture quality. 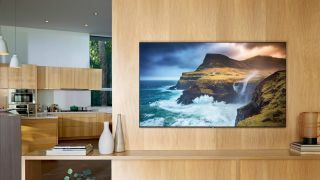 Mounted on four pointy legs, the set looks straight out of a fashion catalogue – and you can see what we thought of it in our hands on Samsung Serif TV (2019) review. Unbelievably, Samsung’s monstrously large 8K TV is still considered a QLED TV. It’s the top of the list for numerous reasons – size and resolution being the most obvious two – but also its ability to use artificial intelligence upscale SD content to 8K HDR. While it's an absolute beauty to behold, the 65, 75, and 85-inch (or 82-inch in the UK) sizes will put you back a pretty penny, starting at £4,999 / $4,999 (around AU$7,082) for the smallest model. Check our review link below for more pricing info. Samsung's 2019 flagship 4K QLED is the Samsung Q90 QLED TV. Like last year you can expect Ambient Mode and better black levels thanks to its Direct Full Array panel alongside the screen’s insanely iridescent peak brightness. But new this year is the addition of ‘Ultra Viewing Angle’ technology, which restructures the TV’s panels so the backlight passes through the panel with lights evenly onto the screen. In the UK you get the choice of a smaller 55-inch model, while the US swaps this out with a larger 82-inch. Moving down the line a bit is Samsung’s Q80 QLED TV. Like the Q90, you’ll see a Direct Full Array panel with a feature set that includes Ambient Mode and the Bixby. The Q80 uses far fewer backlight dimming zones than its Q9FN sibling but still looks great and has a more affordable price point. In the UK, the alternative Q85 QLED model bundles in the external OneConnect box and tidy transparent cable too, as well as coming in a larger 75-inch size. The Samsung Q7FN was the golden ticket to 2018's QLED line-up. Offering one of the best price-to-performance ratios in the entire line-up, it was the Q7F that roped droves of AV enthusiasts into buying a QLED TV. That said, it could be our TV of the year in 2019 as Samsung has listened to our feedback and swapped the edge-lit display for full array LED-LCD that will definitely improve contrast. The first highest series in Samsung's 4K UHD lineup is the RU8000, a sequel to last year’s NU8000. We expect that the RU8000 will use an edge-lit LED LCD panel and a quad-core processor, but that's yet to be confirmed. Expect both HDR10 and HDR10+ support in addition to Bixby and Samsung’s Smart TV platform. Underneath the RU8000 is the curved Samsung RU7300. It's not available in as many sizes as its older sibling, but it should fulfill the niche of a curved screen for folks who want to upgrade to a 4K HDR TV. You’ll likely find the same edge-lit LED LCD panel and processor as the RU8000, but that's still to be determined. The last entry in the 2018 RU Series is Samsung’s RU7100. We don't have a ton of information on Samsung's lowest-end screen in 2019, but we do know that you'll have your choice of screen sizes - the RU7100 will come in a 43-, 49-, 55-, 58-, 65- and 75-inch variation.